Allow us to introduce ourselves, we are Bob and Val Wagner- the primary employees at RiverWood Designs. We built a new wood shop in 2005 right here where we live on the Turtle River, about 12 miles Northeast of the small city of Bemidji, in northern Minnesota. We have 3 children, oldest Matt, is a project manager in Bozeman MT (where we love to visit and fish). Our oldest daughter, Brooke, lives nearby with her husband and two children (her husband proposed to her in the middle of a trout stream in WY.). Our youngest daughter is in college now and she actually won two grand champions at the Minnesota State Fair in fly tying. For me fly tying is both creative and relaxing, check out my favorite pike/bass fly. Both Val and I have wonderful childhood fishing memories. Fortunately our entire family enjoys fishing, it's a tradition and a "life style". Our business and building experience evolved over many years. I spent five years working in a mill-work shop plus building two houses for scratch: scratch meaning pounding every nail, putting up the walls, roof, floor, windows, everything including some furniture. We started selling log furniture in the late '80s and fly tying tables in the late '90s. The relief and full scale fish carving was added in 2001. Val does the sanding and finishing. Her specialty is scouting logging sites for unique wood pieces. Her latest two designs, log foot stools and jewelry or mug trees have proven very popular. We do believe it is a real blessing to be able to live, work, and fish right in your own back yard. 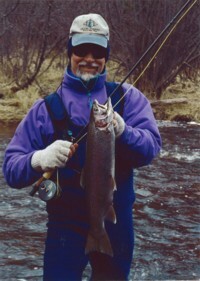 We chase everything from muskies to sunfish with the fly rod including trout and steelhead. We are active members in Trout Unlimited, the Great Lakes Steelhead Association, and the Federation of Fly Fishers. We do believe that working together as private citizens with state and federal agencies contribute to a healthier watershed, improves fishing quality and positively impacts our total environment. If you are in our area, give us a call - we usually have a few furniture items plus fly tying tables in our shop for your review. We do share information on hot flies and what's biting in our area.